If you’ve ever had to witness a parent or loved one suffer with cancer, you know the profound darkness that can engender. Especially in the late evenings, when you’re left all alone with your thoughts. For solace, some turn to literature, others to prayer, still others to things that numb the senses. 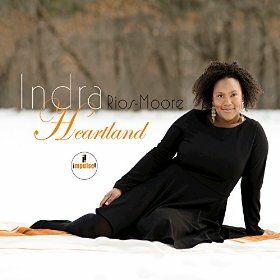 And luckily for us, some, like Indra Rios-Moore, turn to music. During a period in which her mother was battling the disease, and Indra herself was adjusting to new motherhood, she found comfort listening late nights to an eclectic collection of songs, previously recorded by other artists ranging from Duke Ellington to Doc Watson to David Bowie, that she would end up covering on Heartland under the guiding hand of producer Larry Klein, well known for his work with Joni Mitchell, Tracy Chapman and many other fine vocalists. Heartland was largely recorded over a 3-day period just a month after Indra’s mother had died, and what Indra, her band, and Larry have created in the aftermath of her passing is something quite beautiful. Lest anyone get the wrong idea, Heartland is by no means a dark or “sad” album, nor do the songs themselves have anything directly to do with illness or loss; indeed, the album has its share of up-tempo tracks to complement the ballads and slower arrangements, most notably its opening track and compelling lead single, “Little Black Train,” which we recommended in a “First Listen” article in July. I mention the circumstances of Indra’s mother’s illness only to provide listeners with context that may help explain the depth and intensity of some of her vocal performances here, especially on the album’s emotional centerpiece, “For Silence,” a stunningly lovely track showcasing her warm upper register and spine tingling ability to hold a note for meaning, not just for affectation (listen at 2:45 to her extend the word “eyes” like no one quite has before). Some readers may be skeptical regarding whether an album of covers of original jazz, rock and Americana compositions can hang together as a cohesive artistic expression, much less be of interest to soul music fans. The answer is that Indra, and Larry with his considerable feel for the heart of a composition, have taken the essence of these songs and reimagined them largely as a mélange of blues, soul and jazz that cuts across genres. Credit for the appealing soundscape here also must be given to the small ensemble of exceptional supporting musicians --Denmark-based bassist Thomas Sejthen, guitarist Uffe Steen, sax player Benjamin Traerup (also Indra’s husband), and drummer Jay Bellerose of Los Angeles -- who skillfully capture the spirit of the originals and unify the record stylistically but play with an elegant restraint that pushes Indra’s vocals to center stage. It’s the notes they don’t play, and the freedom they in turn give Indra, that in part make this work so well. The musicianship and production on this album create some special moments. Among them is the exquisite cover of “Heroes.” It’s a graceful sonic detour from the rest of the record, veering ever slightly into alt rock ballad territory, with inventive guitar work and production elements that call to mind the atmospherics that Dan Auerbach of the Black Keys created for Lana Del Ray’s excellent album, Ultraviolence. The track has been slowed down to a crawl and is almost unrecognizable from the original, teasing out the romance, and poetry, that was buried in Bowie’s recording. Indra’s expressive vocal makes you literally see the King and Queen kissing along the castle's walls, heroes just for one day. Another highlight is Indra’s cover of the Pink Floyd hit “Money,” which retains the repeating, signature riff from the original – albeit played here on a standup acoustic bass, similar in voicing and texture to the bass line in Miles Davis’s “So What” – but moves at a slower shuffle tempo with blues guitar and sax accents added along the way. This track is the best display of Indra’s considerable jazz chops, her phrasing akin to what I imagine Nancy Wilson would have done with the song in the 1960’s had it existed at that time. Were Nancy to hear this track, I believe she would be smiling broadly and nodding her head in time to the beat. And so, I hope, will you. Overall, Heartland is a “singer’s” album in the best sense, a collection of great songs delivered by a vocalist at the top of her game, and one that reveals itself more and more with each listen. It’s an album that deserves your putting 45 minutes aside, and your headphones on, so that you can really appreciate the work, and soul, that went into it. Fans of Lizz Wright, Ms. Wilson, Etta James and other great blues, soul and jazz vocalists should all find something to like here. Highly recommended.